We’ve all seen a haunted house movie, or two, or a dozen – so why is The Conjuring any different? For starters, as a jaded movie goer if you manage to get me with even a single jump scare – I will stand up and applaud you. It did. But The Conjuring isn’t all loud bangs and quick cuts, at its heart it is an atmospheric movie. Based on a true story, The Conjuring gives us several story lines to keep us occupied. The main one being that of a family who moved into a less than inviting house. Poltergeist is a classic because it is a story first and a horror movie second. 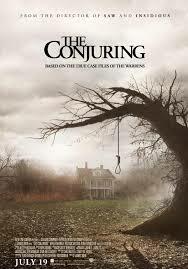 The Conjuring follows in those footsteps: It is a story with strong horror elements. We are lucky enough to consume countless hours of movies and when even a single image manages to linger and give us the heebie-jeebies – the movie has done its job. The Conjuring has quite of few fantastic images that will imprint themselves on your psyche. Congratulations to James Wan and The Conjuring team for a beautifully done descent into the depths of horror and possessed insanity. It really did look like they were going for that old school scare instead of just another creepy kid crawling on a wall routine. This entry was posted on July 27, 2013 by 850music in Posts and tagged Movie Review.